Fallout from this year's consolidated elections is coming to light as Sun Valley Mayor Wayne Willich contended in an interview that some voters were "disenfranchised" by the new absentee voting system. The topic was broached by state Rep. Wendy Jaquet, D-Ketchum, who suggested to Blaine County Commissioner Angenie McCleary that Gov. Butch Otter might want to hear feedback on consolidated elections during his visit to Sun Valley last week. Legislation setting up consolidated elections was passed by the Legislature in 2009, giving the county clerk authority over all elections, including those for cities, school districts and other taxing districts in the county. 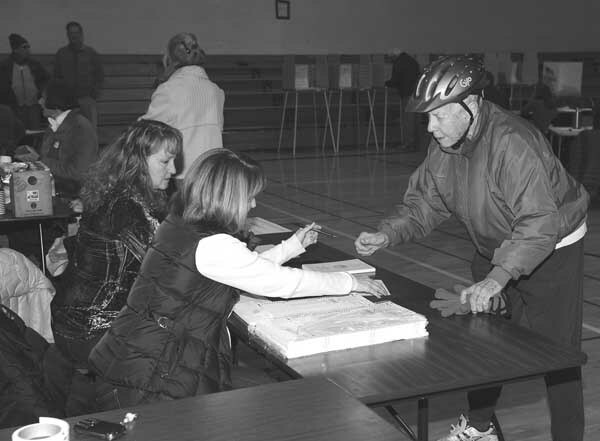 The changes went into effect this year, leading to confusion at some city polling places when residents discovered they could only vote absentee at the county offices in Hailey. "Our primary residents travel a lot, so they were used to the idea of coming by City Hall and picking up an absentee ballot, filling it out and handing it in right there," Willich said. "It was almost like having a polling place right here at City Hall." That option was taken away by the latest election reform, which required that all absentee polling be conducted at the Blaine County Courthouse in Hailey under the authority of County Clerk JoLynn Drage. Drage said last week that she felt the new election procedures worked perfectly, telling the Blaine County commissioners that she doesn't see a need to change. "This was our very first run-through running the city elections, and my office was very pleased with the way they went," Drage told Gov. Butch Otter and Secretary of State Ben Ysursa during the Sun Valley Capital for a Day event last Wednesday. "The process went much more smoothly than I had expected." The consolidated election procedures provide for more accountability, consistency and integrity, Drage said, as all elections are overseen by the county rather than being parceled out among taxing districts. For example, the county discovered earlier this year that the Picabo Cemetery District, from all appearances, had not had a legally elected board since 1992. An elected board is required because the district collects more than $10,000 in property taxes each year from its residents. Drage said in September that consolidated elections would prevent such oversights in the future, due to the increased consistency created by putting the county in charge of all elections. "My understanding was that the changes were for consistency," she said during the Capital for a Day event last week. "It was about maintaining the consistency for voters." But Willich said the changes created less consistency for city voters, who were used to going to one polling place and now were told to visit another. "This time around, people arrived at City Hall, and [city employees] said, 'No, it's all handled by the county,'" he said. "Some people got disenfranchised this way. We weren't very happy." Ketchum City Clerk Sandy Cady said she had a few complaints during the Ketchum city elections as well. However, she said she felt the complaints mostly stemmed from the fact that the procedures were new. "Some [people] didn't like that, but it's new and I don't think they're aware of it yet," she said of absentee voting at the county offices in Hailey. "Going forward, if people know that, I think it will be fine." But Willich said he would rather see a legislative fix to the issue, perhaps giving the county clerk the authority to set up remote polling places at city halls where absentee voting could be conducted. Blaine County Commissioner Larry Schoen suggested this plan to Drage last week, suggesting she "deputize" city employees as election clerks. However, Drage said that solution wouldn't work. Though clerks at polling places on election days are effectively Drage's employees for a day and therefore report to her, she said city officials have no such accountability to her. "I don't have the authority to deputize people who are not my employees," she said, adding that she was not willing to attempt to have city employees report to her. "I'm more concerned about the integrity of the elections." Willich took issue with the idea that integrity would be compromised by allowing city clerks to hold elections. "It's a very minimal risk of voter fraud or anything," he said. "It's not even worth talking about." On the contrary, Willich said he thought it was possible that confusion over absentee voting—where to vote and whether the county election office was open on Friday, for example—could have resulted in an unfair rejection of a $14 million bond issue put to the voters in November. The general-obligation bond measure needed a super-majority, or 66.6 percent approval, to pass. It received 64 percent. "In my wild imagination, I can imagine that there were the right number of [missing absentee] votes to pass the bond, and they all would have voted for the bond," Willich said, adding with a laugh, "That's just my fantasy." Cady said she feels as though absentee voting confusion did not affect the elections in Ketchum. Drage said that regardless of confusion, those wishing to vote absentee have plenty of opportunity, as they may also request absentee ballots to be mailed to their homes. Voters can then mail or fax them into the county election office. "I feel [the system] works perfectly the way it is," she said.